While I'm a big fan of the traditional color palette for Christmas, I like how fun and fresh this note is. The colors we were to use were Old Olive, Bashful Blue, More Mustard and Crumb Cake (or something thereabout -- I assign Stampin' Up! colors to those challenges). This is also a simple and versatile layout. 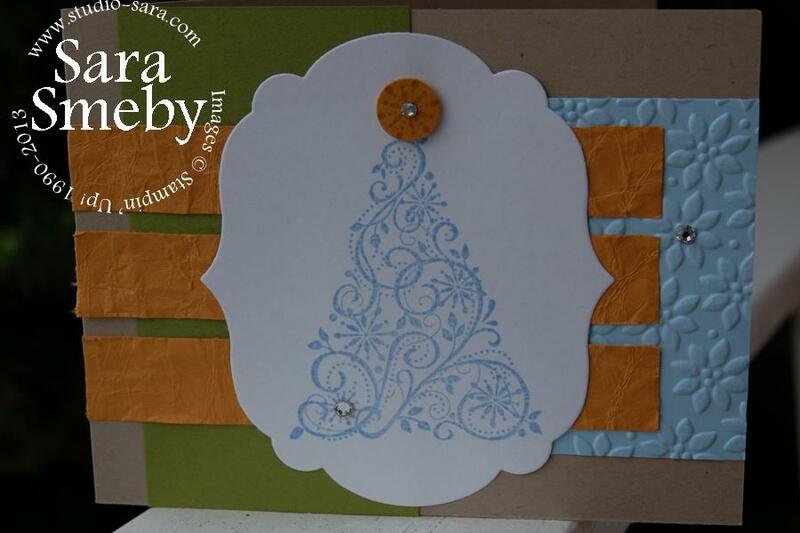 By crumpling the scraps of More Mustard and adding a dry embossed layer (and rhinestones! ), texture abounds in this project... The Labels Collection Framelits make the basis of the focal point easy to create. In a second project, I was going for a bright and cheery look without the traditional colors. 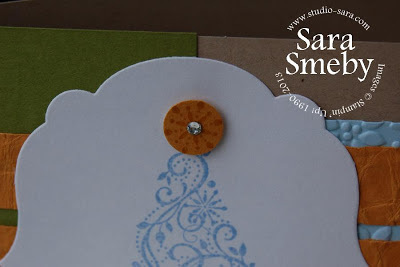 Using Tags til Christmas and my ornament punch, I created the Melon Mambo ornament, tied off with a bit of white floss. 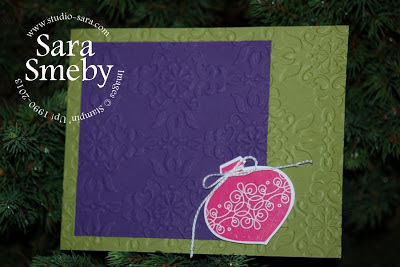 The texture in this card was created using the Vintage Wallpaper Textured Impressions Embossing Folder ("TIEF"), and turning the card base to show the opposite relief from the Elegant Eggplant layer. Accessories: Big Shot (113439), Labels Colleciton Framelits (125598), Petals-A-Plenty TIEF (116824), Vintage Wallpaper TIEF (120175), Rhinestone Basic Jewels (119246), 1/2-inch Circle Punch (119869), Ornament Punch (119847), Color Coach (120148), and Stampin' Dimensionals (104430).